Lindale Middle School Hosts E-Nable Event — Dankmeyer, Inc.
On April 22, 2017, Kristen Beltran, Board Eligible Prosthetist Orthotist, and Art Ross, Fabrication Technician, attended the Anne Arundel County Schools E-Nable event at Lindale Middle School. For the Science, Technology, Engineering, and Mathematics (STEM) elementary and middle school students, this was a culminating event to showcase their efforts on a series of projects they worked on throughout the school year. These projects include biomimicry, film segments on various medical conditions, and writing children’s books about amputation. 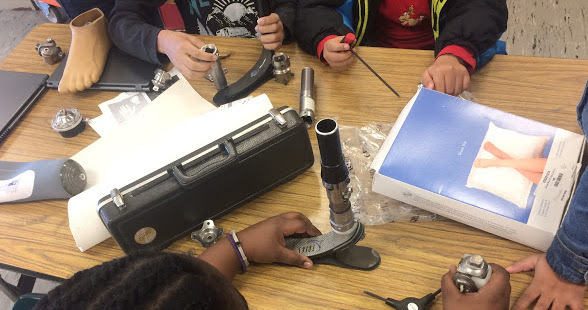 At the end of March, STEM teachers came to the Dankmeyer office in Linthicum to see a prosthetic and orthotic practice in action, and to film our technicians at work. Chuck Poole, Fabrication Director, provided the teachers with some tools and various prosthetic parts to take back to their students. This would allow the students to get up close and personal with the components. One of the teachers, Dan Fitzgerald, said that the students felt trusted and thought that it was a good experience for them to get exposure to the technology used to make prostheses. Left to Right - Brad Sweet (STEM program), Art Ross, Timm Green (STEM program), and Kristen Beltran holding student books. At the E-Nable event on April 22, Kristen and Art spoke to the students about different types of prostheses and orthoses, shared their passion for their jobs, and showed how various upper and lower limb prostheses and orthoses work. Feedback from the students showed how excited they were about the hands-on work with the various types of tools and equipment. The middle school students will provide Dankmeyer with the children’s stories they wrote on amputations. They want their stories to be shared with the community. We hope to post some of these creative works soon. You can read about last year's event by checking on our Older News below. If you are interested in knowing more about this program, or 3D printing please let us know! Send an email to info@dankmeyer.com.